This film takes place after Senegal's independence from France, when it appeared that, at long last, power would shift from the French conquerors to the Senegalese people themselves. There is a sense of joy in the air and people celebrate outside. Yet in the local chamber of commerce, something very different occurs. Although the white colonizers are leaving their positions, they will not go without making a statement: every African businessmen who replaces them receives a case full of bribe money. Aboucader Beye or "El Hadji" is one of these businessmen. He gains money in corrupt ways on the black market, and uses his "earnings" to pay for a marriage to a third wife. Yet on his wedding night, El Hadji finds that he is impotent, and the film's title itself references this moment of shame--a "xala" is a curse of impotence. Throughout the film, he tries desperately, and sometimes humorously (to the audience, at least), to find a cure. Despite its comic and satirical moments, Xala is a film with serious commentary about corruption as a result and a continuation of European colonialism. Colonialism may be over officially and on paper, but it has created an economic environment that lingers and stifles Senegal's growth. SORENSEN, ELI PARK. 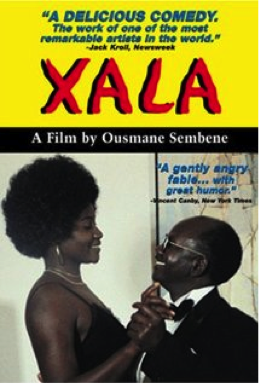 "Naturalism And Temporality In Ousmane Sembène's Xala." Research In African Literatures41.2 (2010): 222-243. Academic Search Premier. Web. 3 Dec. 2013.